“Napoleon Dynamite” Neapolitan Cupcake Recipe | Exploring Food & Drink in D.C.
We don’t typically preface most of our recipes with any introduction. We like to think our images speak for themselves. However, these cupcakes were a true labor of love *cough cough brilliance cough cough*… for a 5-year-old. What exactly happens when your picky eater of a 5-year-old (completely out of the blue) says, “I want vanilla, and chocolate, and strawberry cake” for her birthday? Step one: Panic. Step two: Scour Pinterest, pray and possibly make a couple live sacrifices to the internet gods for a sign (or better yet an actual recipe). Step three: Realize panicking is futile, and that Pinterest is basically an existential trap for your creative soul, then resolve yourself to solve this problem like Einstein solved E=MC². Guys, this really was rocket science. Obviously we named our cupcakes after the cult-classic film. A cupcake with mish mash of flavors, an explosion of colors, with outrageous personality – we couldn’t think of a better or more fitting name. The best part of our “Napoleon Dynamite” Cupcakes is that you can use your favorite vanilla cake recipe. We happened to get lazy (we were working on these at 6:30am the day of the birthday), and used a Pillsbury boxed mix. We know, shame on us. But really, you’ll probably thank us later for that suggestion. Our box mix said it’d make 24 cupcakes. It didn’t. It only made 12, which was perfect. We wanted them bigger than life here people. BIGGER THAN LIFE. Side note: Anytime something calls for vanilla, we break out the Madagascar Bourbon Vanilla Extract . We think it has some of the best vanilla flavor possible. You will need piping bags, 1 large decorating tip, parchment paper, cupcake liners, and rainbow sprinkles. Make sure to SIFT your confectioners sugar. 1lb (2 sticks) Salted Butter – Room Temp. While waiting for your cupcakes to reach room temperature, temper your chocolate by melting ⅔ of your desired amount over a double boiler, stirring constantly until chocolate reaches 110-115 degrees. Remove from heat, and allow to cool by another 10/15 degrees. Add your remaining chocolate, and stir until incorporated/melted. Using a piping bag or baggie, pipe your designs onto parchment paper. Pour over chocolate, and whisk until melted, smooth, and shiny. Once cooled, gently pour on top of room temperature cupcakes starting in the middle and working out to the edges. If working in a warm kitchen, pop the cupcakes into the fridge to allow ganache to set before frosting. Over medium heat, bring strawberry puree to a boil, stirring constantly, and reduce by half. Adjust heat lower if necessary. Once reduced, set aside and allow to cool. Beat butter until soft and smooth. Add in 1 cup of confectioners sugar, and continue to beat. Add in 2 TBSP of your cooled strawberry puree and the vanilla. Continue to beat until incorporated. Add in another 2 TBSP of strawberry puree, and another cup of confectioners sugar. Finally, add in the remaining confectioners sugar, and 2 TBSP of strawberry puree, and continue to beat until fully mixed. If necessary, store your frosting in a plastic dish in the fridge until ready to use. When ready, using a piping bag with a large decoration tip, pipe two layers of frosting on top of the chocolate ganache. Top frosting with rainbow sprinkles, and chocolate piped design. If tempered properly the chocolate shouldn’t melt, however if you’re worried the cupcakes will keep in the fridge for several hours before it’s time to serve. 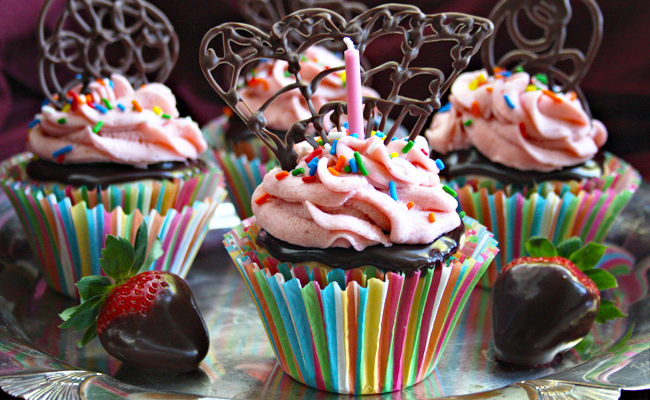 Tags: chocolate ganache, cupcake recipe, napoleon cupcakes, Neapolitan cupcake, recipe, strawberry frosting. Bookmark the permalink. Oh these cupcakes look super yummy. I really love the frosting design and the cupcake holders really make it look even prettier. These cupcakes look delicious. Love the variety. What a beautiful work of art. Look so pretty and tasty. I am a sucker for a yummy cupcake. Those sound awesome! Every part of those cupcakes just makes me happy. I love this recipe! That is awesome! They turned out so pretty, I thinking about making them for my daughter’s birthday! those are super cute, I wish my cupcakes looked that professional. I am filled from dinner but can have some room for this. Wow, these look incredible! Thanks for sharing the recipe, can’t wait to try it! Oh I love cupcakes and yours look great. Thanks for sharing. My daughter will love to make these! I’m a big fan of cupcakes and those are beautiful! Will definitely try them! Never really thought cupcakes could look this gorge! What a cute idea. I have never had a napoleon cupcake before, but would definitely give it a try. Those look beautiful, and very yummy looking. That movie still makes me laugh! Cute cupcakes! Not only do these look DELISH, but I love the name! These look like such tasty cupcakes! LOVE the chocolate accents too! Strawberry is my favorite frosting too! These cupcakes look amazing. Perfect to take to work for a special occasion. Pinned to my dessert board. These cupcakes look like so much fun! My girls would totally love the rainbow sprinkles! The cupcakes look like a lot of fun. I was trapped watching Napoleon Dynamite on television just the other day. I couldn’t stop watching it and laughing. Ironic I would run across your cupcakes today! Love it.